Originally posted March 1995. Added notes in italics in November 2001. 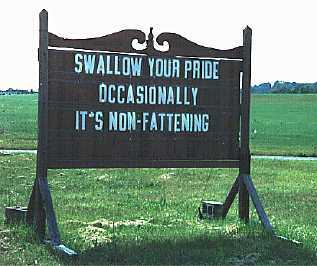 There's a sign somewhere that used to say something that it doesn't say anymore. These pictures may look a little goofy. The scanner I was using scanned the colors much too dark; I tried modifying the colors in Photoshop. It kinda sorta worked, as far as I can tell. They're better than the originals, anyway. About five miles outside of Lancaster, Pennsylvania, there's a big wooden sign with replacable letters. As of mid-1996, it was no longer used, but before then, it was invariably used for those "inspirational pun" sort of sayings. Like "doing good turns doesn't make you dizzy". 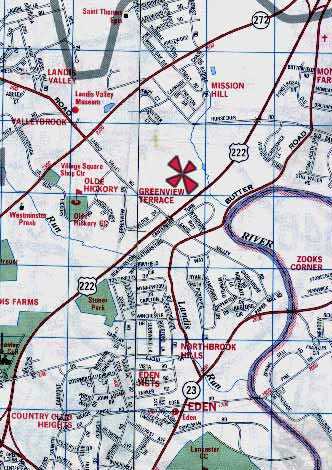 It's sitting on farmland. There aren't any street lights, so at nighttime, you can't see anything. It's pretty isolated. So I'm thinking to myself: hey, I have some possiblities here. Why not rearrange the letters some night, like, two in the morning? Eleven people sent 37 different anagrams. I took a picture of the sign around 4pm on Friday, so I'd have a "before" picture. The prizes were awarded from the t-shirts I used to sell. 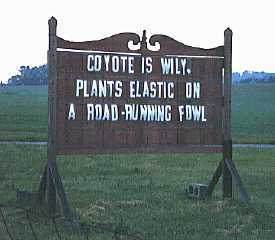 He wins for his entry: COYOTE IS WILY, PLANTS ELASTIC ON A ROAD-RUNNING FOWL. At a close second for his entry: INCONTINENT DAYS ARE LOUSY -- LOTSA CRAP FLOWING. I might have used this, if it weren't for my vulgarity restriction. She gets second prize for sending the most valid anagrams with the least number of letters left over. He wins for being the ninth person to enter, and the first person to make the subject of the email "sign contest" like I asked. He was the first to enter, and his anagram made me laugh and laugh and laugh. And then, the next day, something happened that I can't explain.